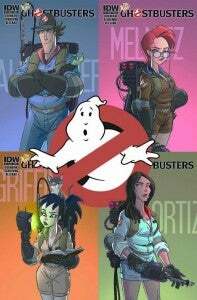 IDW Publishing released a press release and teaser image today promoting the upcoming February revamp of their popular Ghostbusters comic books. Starring a whole new team of Ghostbusters taking over from the captured Spengler, Venkman, Stantz and Zeddemore, a new, younger team will be assembled by Janine, with the twin goals of keeping the city's paranormal activity in check and of rescuing their predecessors, who have been abducted by supernatural forces. The series will relaunch with a new #1 issue, but the creative team of Erik Burnham and Dan Schoening, along with series colorist Luis Antonio Delgado, will return. On television, there's been a similar story--although there, the new team happened because the Ghostbusters simply ran out of ghosts to bust for a while and moved on to other things. The abduction story serves the ongoing comics better, because while Extreme Ghostbusters--the show that replaced The Real Ghostbusters--came out years after its predecessor and the series acknowledged that, this new volume of the comics will be picking up basically immediately after the previous one ends. Still, it's impossible to ignore the connection between the properties, especially with IDW recently collecting the old NOW Comics The Real Ghostbusters in an anthology. And, of course, there's Kylie Griffin. Kylie was the fans' favorite Ghostbuster in Extreme Ghostbusters, and the only character with actual paranormal experience prior to becoming a Ghostbuster (the rest were Egon's students in a class he was teaching). The sarcastic goth girl managed to be a bright spot in what's not widely regarded as a good series, so it's probably not surprising that she's the only of the next-gen Ghostbusters from the Extreme series to get a spot in the comics lineup.